Get Our Free Checklist – It’s a Must-Have! Your career website is the central hub for communicating your employer value proposition to candidates but did you know that 40% of candidates will bypass your career website and will land directly on the job description page? Now knowing this, you can enhance your job description page to be a part of your recruiting strategy and attract top talent. 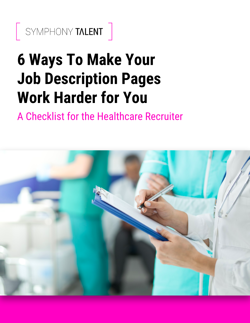 Our recruitment marketing experts at Symphony Talent pulled together these top 6 ways you can make your job description page more effective that will drive measurable results.